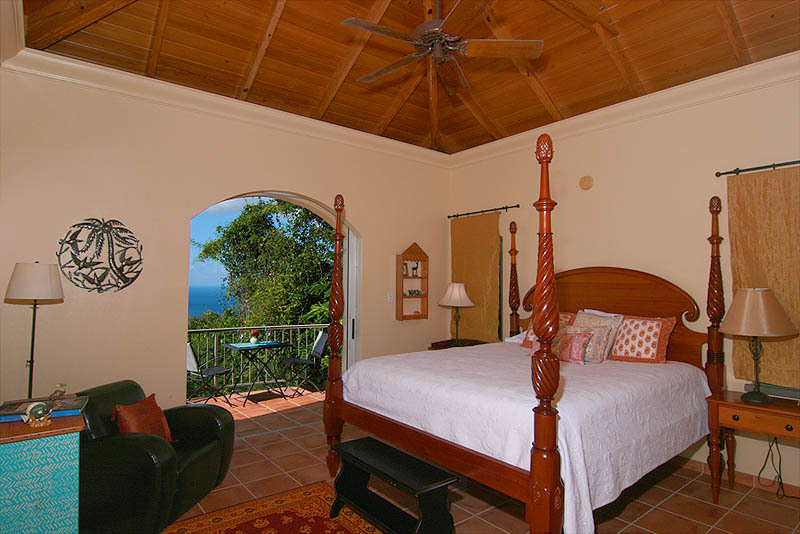 looks out to the breathtaking Caribbean panoramas of St. John's famous North Shore. 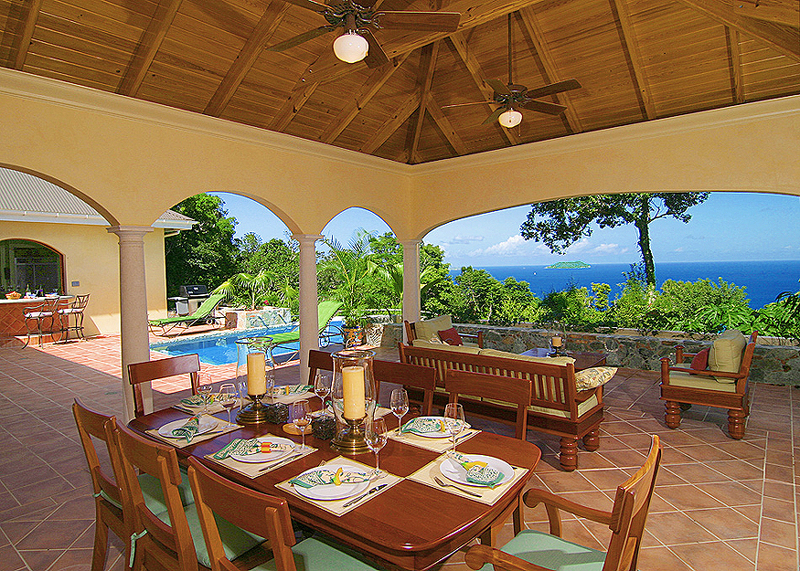 The Peace & Plenty Great Room with chef's kitchen, breakfast bar, pool serving bar, and a sweeping Caribbean view. Villa Size 4300 Sq. 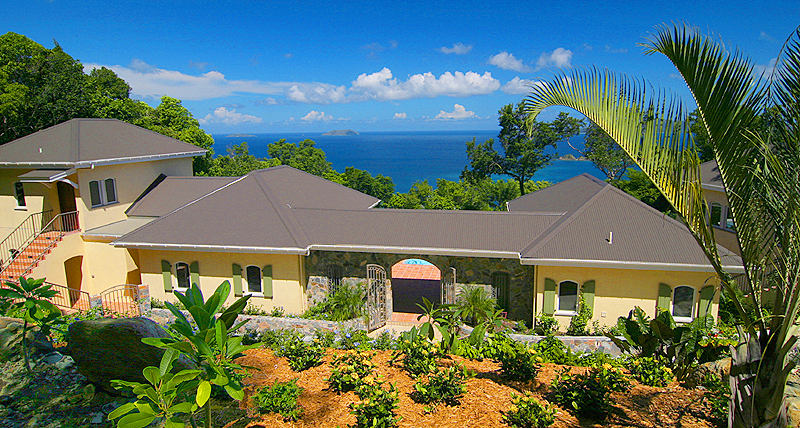 Ft.
Villa Peace and Plenty is a magnificent Suite St. John ultra luxury villa located on St. John's exclusive North Shore. 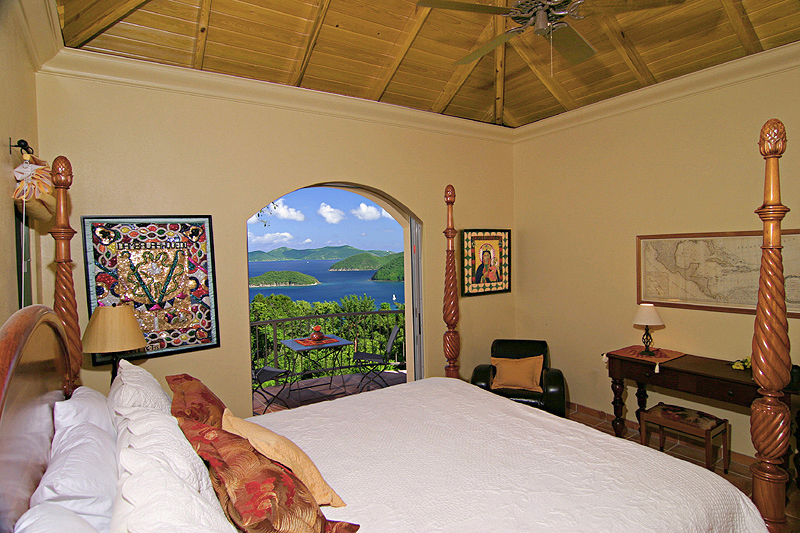 This elegant St. John villa consists of 3 buildings that stretch more than 130 feet and are tied together with decks and covered walkways and a gazebo. Most of the livings areas are on the main level. You park just outside the door and enter onto the pool deck. The great room and two bedrooms are on the left of the pool and the outdoor living area and two more bedrooms are right of the pool. A hallway off the great room leads to the lower left bedroom, while the upper left bedroom is accessed by exterior stairs. The right pair of bedrooms is beyond the outdoor living area (lanai) with each of the two bedrooms being a half level below or above the pool deck level. A game room with a ping pong table is on the lower level. The name "Peace and Plenty" is an accurate description of the setting - plenty of peacefulness and tranquility and plenty of privacy. 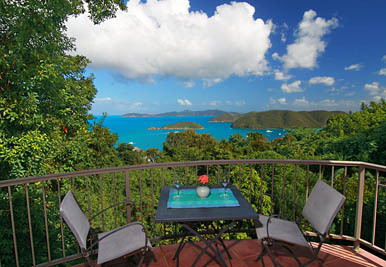 You’re located 480 feet above Cinnamon Bay and the views of Jost Van Dyke in the distance and Whistling Cay, Mary Point and the National Park in the foreground are absolutely gorgeous. Cinnamon Bay and Trunk Bay lie below you and offer excellent swimming, snorkeling, kayaking, wind surfing, sunning and stress free relaxation. It's a 10-15 minute drive from Cruz Bay and the last 1/2 mile is a bumpy dirt road intended to discourage tourists from exploring this quiet neighborhood. 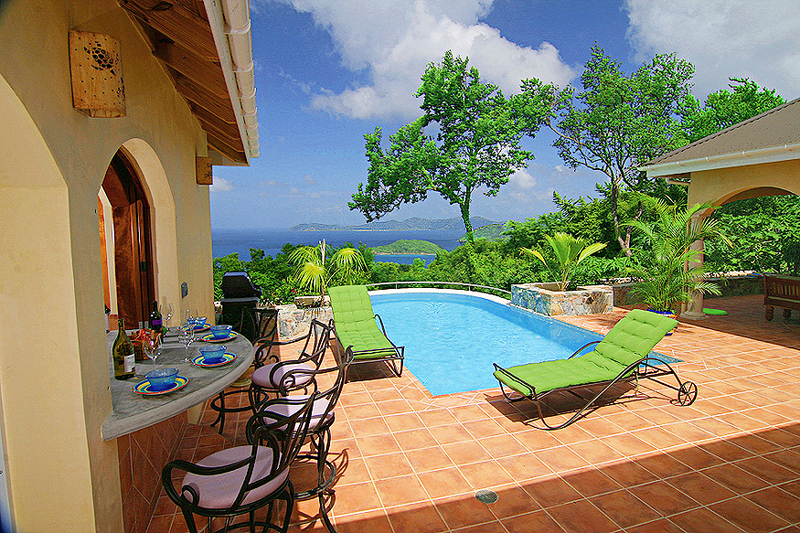 Suite St. John Villas most recent addition to its rental management portfolio of exceptional villas is "Peace & Plenty" located in the the exclusive Catherineberg neighborhood of St. John overlooking gorgeous Cinnamon Bay. This neighborhood is one of St. John's most beautiful and desirable neighborhoods. In this unspoiled setting in the midst of world-class National Park beaches, you're surrounded by a naturalist's world of sea, sky and pristine park lands. A short driving distance from "Villa Peace & Plenty" are Cinnamon Bay Beach, Hawk's Nest Beach, Trunk Bay Beach, Maho Beach, and Francis Bay Beach. If you value tranquility, natural beauty and the feeling of being alone, this is heaven on an island. "Peace and Plenty," is the 4th from the last villa on a dead end road named Wattapama Road , ensuring very little traffic and superb privacy. 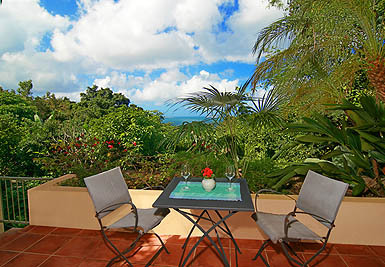 The dense tropical forest around you ensures that you can neither see, nor be seen by neighboring villas. Catherineberg is also one of St. John's safest neighborhoods. As for the villa itself, the photos leave no doubt that "Peace and Plenty" is a spacious, beautiful, and very comfortable luxury villa. Everything about this villa is appealing; from the bedrooms to the great room to the outdoor living area, this is a very tasteful home with a distinct sense of island elegance. "Peace and Plenty" is an excellent vacation home for families or for 1-4 couples, and this romantic and beautiful setting is also well suited for honeymooners and lovers. If your travel plans include more than 8 people, "Peace and Plenty" together with "Cinnamon Bay Estate"offers two stunning world-class villas within walking distance of each other. 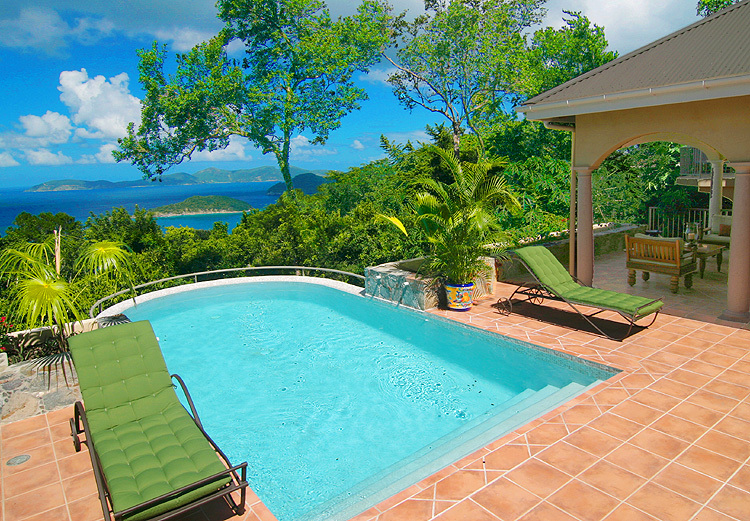 Cinnamon Bay Beach is the Villa Peace & Plenty is your neighborhood beach. Cinnamon Bay Beach, a short drive (or hike) down the hill from Peace & Plenty is a mile long white-sand beach with plenty of space and shade. 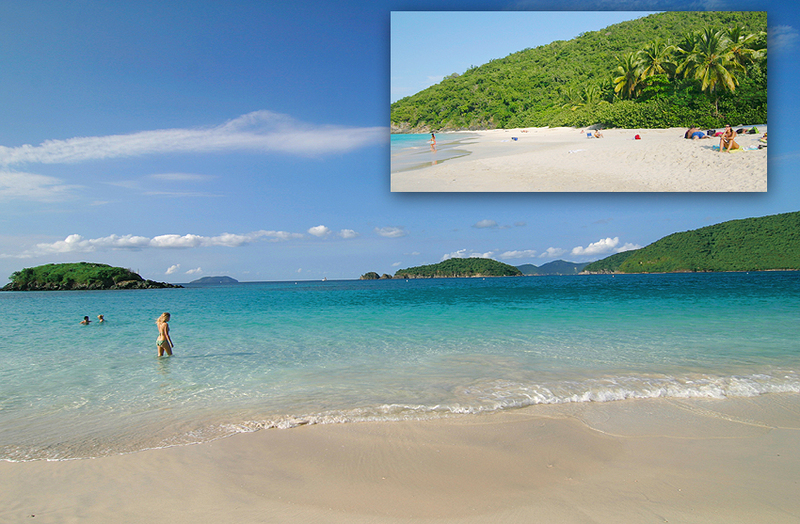 Cinnamon Bay Beach offers clear, warm turquoise water for invigorating swimming & snorkeling. A water-sports hut offers the latest in sunsails, hobie-cats, kayaks, and other water sports rentals. A small snack bar and convenience store is available. 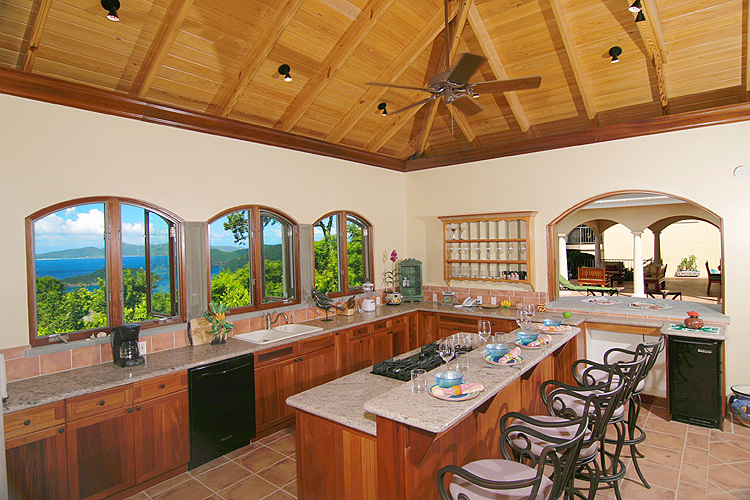 Kitchen - The gorgeous kitchen is defined by granite, mahogany, and lovely views seen through arched windows that run the length of the kitchen. A granite and mahogany bar/counter that seats 4 separates the kitchen from the living room. Behind the bar is a gourmet kitchen with custom built mahogany cabinets, granite countertops, a 5-burner gas stove and oven, large refrigerator/freezer, dishwasher, icemaker, microwave, toaster, blender, coffee maker, and abundant cookware and dinnerware. 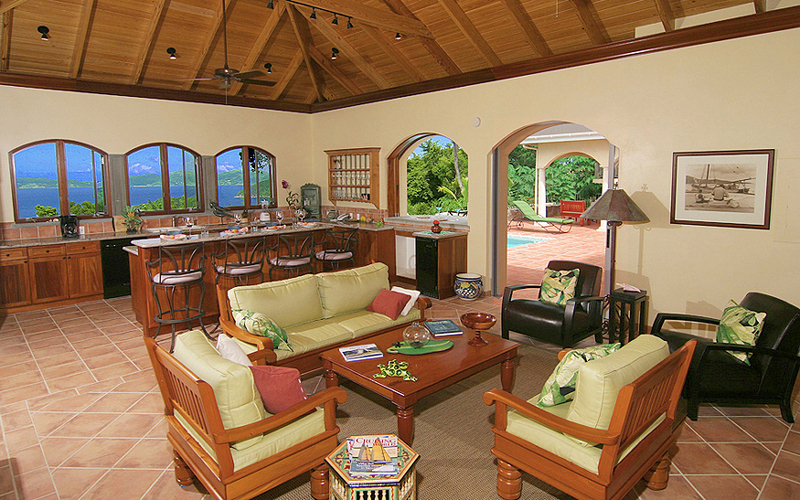 A half moon bar (below) with bar chairs is off the kitchen and opens to the pool deck through a window. The elegant pool, with half moon bar, takes full advantage of the gorgeous view. Jost Van Dyke is in the distance. a Spanish style courtyard with a dramatic pool and outdoor living area opens to St. John's North Shore. Interior Living Room - You enter the 600 sq/ft great room through screened sliding pocket doors. 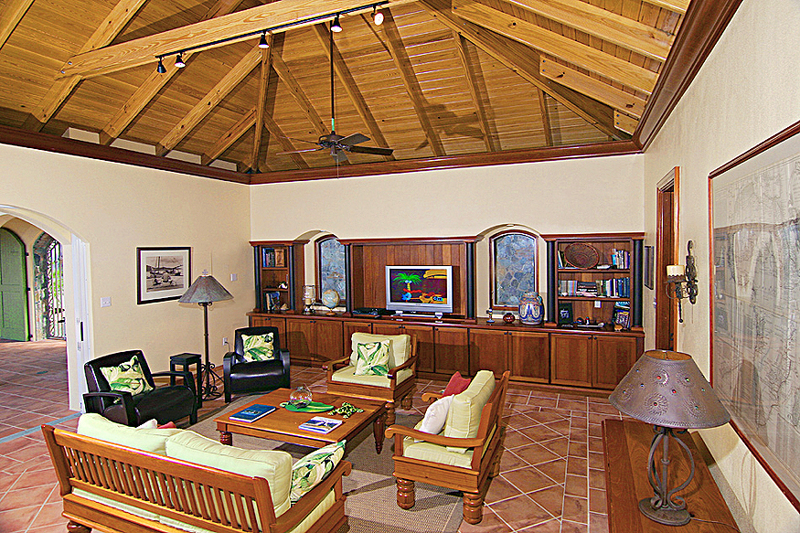 The great room has a handsome, classic Caribbean look with tiled floors, beamed cathedral ceilings with track lighting, and custom built mahogany furniture and cabinets. A 42” cable HD plasma TV/DVD and stereo/CD provide the electronic entertainment. The Peace & Plenty living room, decorated with mementos from world cultures, includes a 42" HD-LCD TV with cable. Outdoor living area - One of the most popular design features in an island home is a lanai (outdoor living/dining area), such as that found in the very popular villa Rapture. Peace and Plenty takes great advantage of its lovely setting with its comfortable 500 sq/ft lanai. This is more than a deck with furniture; it’s an outdoor living area with comfortable furniture and a 10 person dining table that sit under a large gazebo that protects you from the sun and the occasion island shower. 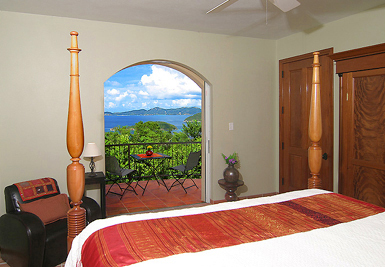 From the lanai you look through columned arches at the beautiful views of Jost Van Dyke and the unspoiled National Park. The half bath is just off the lanai, as is the gas grill. 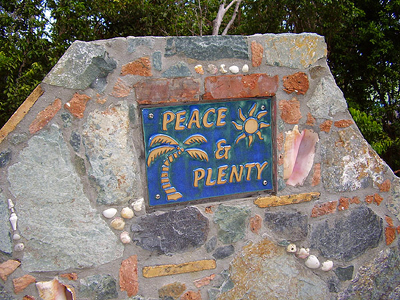 Guests are greeted with this island sign of the peace and privacy offered at Villa Peace & Plenty. 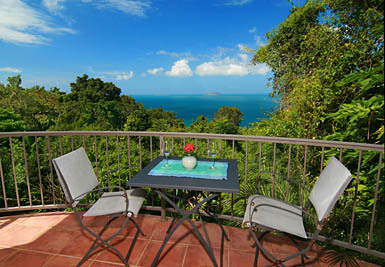 It is located within the boundaries of VI National Park, a short drive or hike to the magnificent North Shore beaches. Bedrooms - The four air conditioned bedrooms are equal in size (about 225 sq/ft) and each includes a private balcony or deck and an elegant granite and mahogany tiled bath. 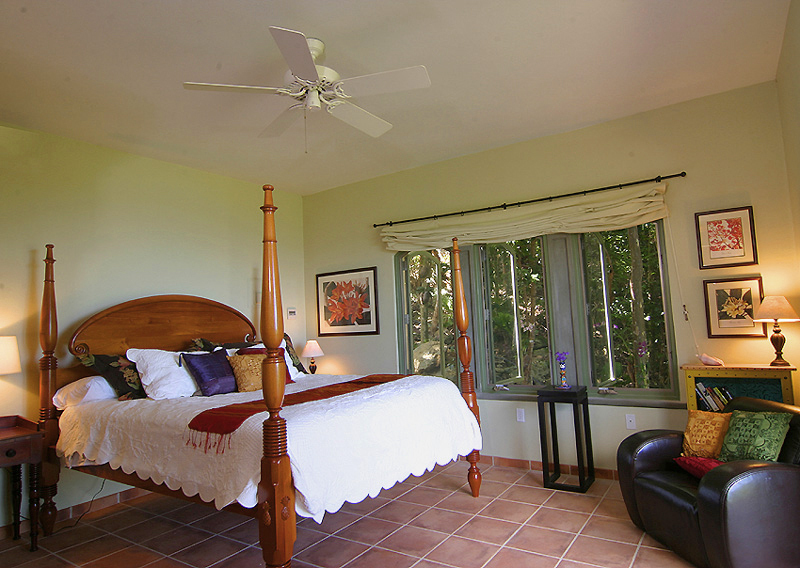 All the bedrooms include custom built mahogany 4-poster king beds that look out at the romantic views. and hand-carved mahogany furnishings. 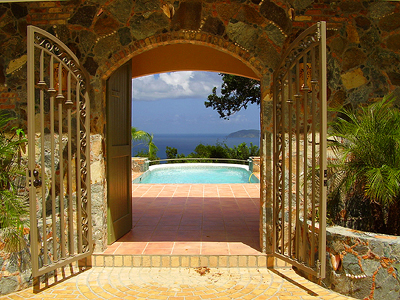 The upper Master (above) overlooks the U.S. and British Virgin Islands. 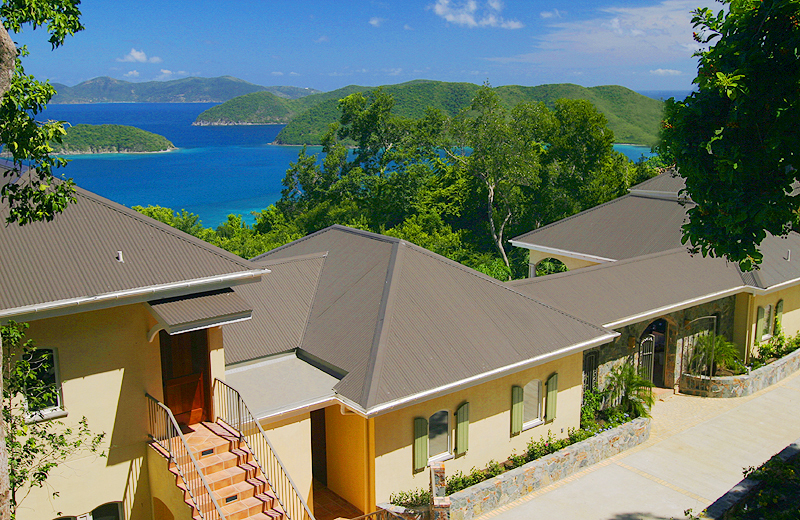 enjoy beautiful Caribbean views looking towards Jost Van Dyke in British waters, and Mary Point in U.S. waters. 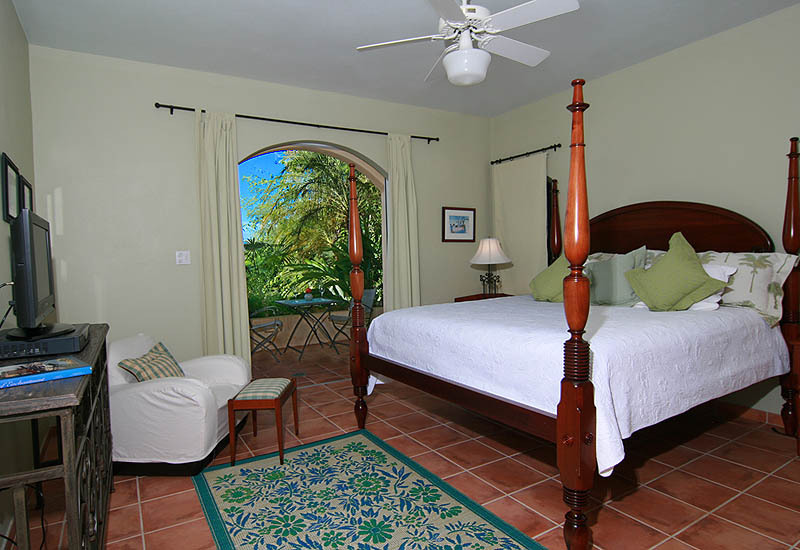 The Lower Master Bedroom enjoys a tropical garden setting, with a private Caribbean view balcony (above, right). with hand carved poster king bed, also enjoys a wonderful private ocean view balcony (below, left). The private balconies of the Upper Bedroom (left), and Lower Bedroom (right) in the Garden Wing. The Lower Master Bedroom of the Garden Wing with a king poster bed, and private balcony (above, right). 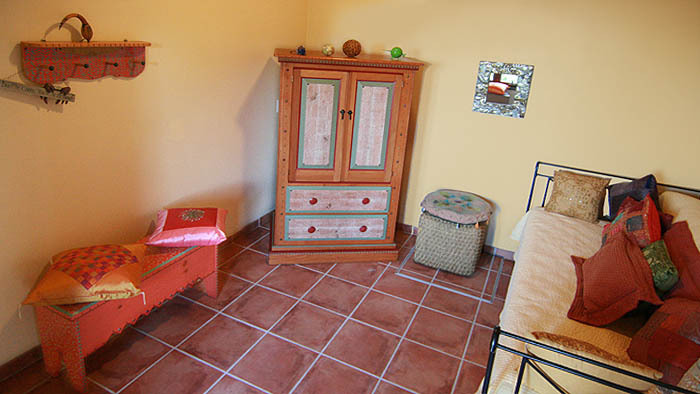 The trundle bedroom located in the Great House offers a 5th guest bedroom. Surrounded by "Peace and Plenty"
*Add 20% to above "7-8 Guests" rate for President's Day, Easter, & Thanksgiving. Website Design, Development, & Photography by Rolando Garces. reproduced or used for commercial purposes without the express written consent of Suite St. John Villas & Condos.